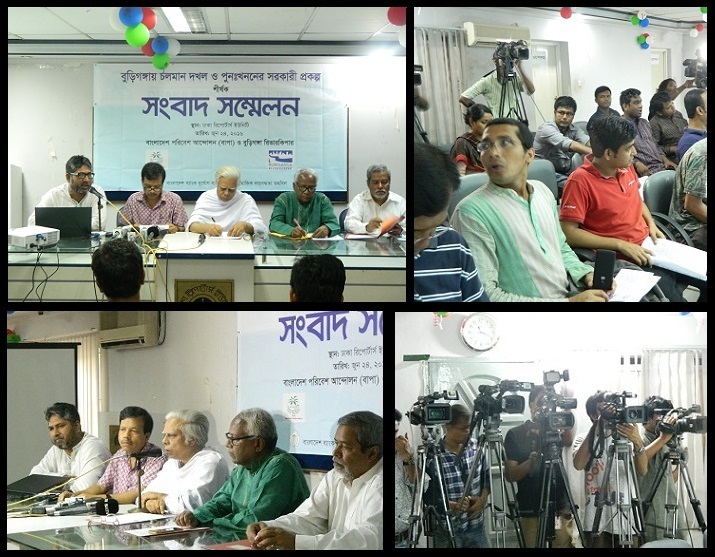 A press conference on ‘’Ongoing Encroachment on Buriganga and Re-excavation Project of the Government’’ was held on June 24, 2016 organised jointly by Buriganga Riverkeeper and Bangladesh Poribesh Andolon (BAPA) at Dhaka Reporters’ Unity auditorium at 11:00 am. In the press conference, ongoing encroachment activities on Buriganga and re-excavation project of the Government worth taka 1125.29 crores were discussed. Sharif Jamil, Buriganga Riverkeeper and Joint Secretary, BAPA was the keynote speaker at the press conference. Eminent columnist and Vice-President, BAPA Sayed Abul Maksud; Coordinator, Buriganga Bachao Andolan, BAPA Mihir Bishwas; Joint Secretary, BAPA Shahjahan Mridha Benu and Member, National Committee, BAPA, K. M. Nurul Huda also spoke on the occasion. In the press conference, ongoing encroachment on Buriganga was exposed by a multimedia presentation by the keynote speaker. After an extensive fieldwork, the situation was found more severe in some areas, like- Luterchar-Behurarchar of Shamlasi-totaliapara, Washpur near Basila, Balurmath, Modhdherchar-Jhauchar, Kholamura, Mandail were the flowing riverbed is also under grabbing. Jamil and his team visited Buriganga and documented the encroachment and filling activities of the river and adjacent areas many a times. The Riverkeeper found that almost everywhere in Luterchar-Behurarchar of Shamlasi-totaliapara, housing companies and brickfields are filling the river and adjacent canals. The aggression of a Power Company and some real estate companies in Washpur area were filling up river area and already blocked the channel coming from Dhaleswari River. Near Rayer Bazar Khal, Metro Housing and Shikder group are grabbing river. In Keraniganj near Jhauchar, Modhu Hazi River View Project has been grabbing river and adjacent canals for years; but unfortunately, the Government is not taking any legal measure to protect the river from ongoing encroachment. He also mentioned, ’’we have been protesting encroachment of Buriganga with evidence and documents since 2012. But the Government did not take any effective step. Even the National Task Force for Rivers of Bangladesh did not initiate necessary steps to stop encroachment. We repeatedly presented the follow-up in 2014 and 2016 where the encroachment was going on openly in and around Adi Buriganga (2nd Channel) ‘’ Sharif Jamil also addressed on the recent Dhaleswari-Pungli-Bongshai-Buriganga re-excavation project of the Government worth taka 1125.59 crores. He said, ‘’Without taking any measure to stop encroachment, the outcome of the re-excavation project is questionable. The Government has to stop all types of encroachment and filling activities on the river; has to set up demarcation pillars accurately and must initiate legal steps for the eviction of the encroachers’ before any re-excavation.’. Sayed Abul Moksud said, ’’the politically influential people are involved in river encroachment. Even the government organisations are building their heavy structures on the river. To protect the river and adjacent canals a separate authority should be formed for the Buriganga. They will monitor the river, collect data and inform people about the status of encroachment’’. He also advised arranging a cabinet meeting on the boat so that the policymakers can realise the present status of encroachment. Md. Shahjahan Mridha Benu said, ‘’we are failed to protect Buriganga, though we have been working for a long time. Lack of cooperation from the Government is a problem. We want media to steer the movement where we will support them for protecting rivers’’. M. Nurul Huda said, “if Buriganga dies, Dhaka city will die soon. He fears that Dhaka will lose its habitability and that is why he expects a strong initiative from the government to protect Buriganga and another river system around the city. The government should ensure effective steps against the encroachers immediately to legitimate the project. To include riverbank community and environmental organisations in the decision-making and implementation process of any such project. The demarcation pillars should be put up first according to the judgment of the high court. Construction of walkway and guide wall should be stopped unless the river area is properly demarcated otherwise the river grabbers are apparently getting legalised while the river is losing it’s land permanently. The original Buriganga river from Dhaleswari River to Lalbagh Lohar Pool is to be fully recovered. Legal actions should be taken against the encroachers and government employees who helped the encroachers.